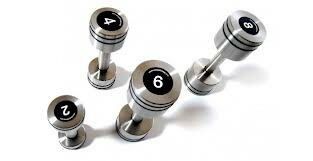 Designed with integrated rubber grips around the head, these versatile dumbbells can be used in a multitude of workouts. Made from highly durable Steel. High quality steel, no odour, hard wearing, rubber inserts and grips to improve hold. Screwed heads and handles with double integral rubber inserts to protect the dumbbell and other surfaces. Available in weights ranging from 1-20Kg, Based in 1Kg increments up to 10Kg, after which 2kg increments appear after 10Kg up to 20Kg.